TELL ME paper regarding health care workers ambivalent risk perception, published in American Journal of Infection Control, has gained a lot of interest all over the world. The study made by the staff of the Faculty of Public Health of the University of Haifa coordinated by Manfred Green was cited by The Jerusalem Post, San Diego Jewish World, Times of Israel, Science Daily, Be In today, Infection Control Today, International Biosecurity Intelligence system. 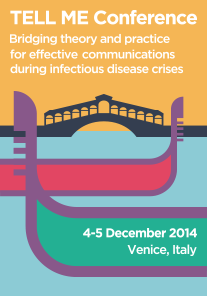 Can social media be used as a way to prevent the spread of infectious diseases? Such a question is certainly on the agenda right now, with the Ebola outbreak currently raging in West Africa and having already claimed the life of 887 people out of 1,603 casessince this March. This epidemic is caused by a lethal but not highly contagious virus, which does not transmit just by breathing. The only way to get it is to come in contact with the blood, secretions, organs or other bodily fluids of infected people, usually through person's mucous membranes or broken skin. The first probable case of Ebola virus disease (EBV) has been reported in Nigeria: it is a 40-year-old male from Liberia who spotted symptoms during his travel to Lagos, on July 20th. He was immediately admitted to a private hospital but died five days later. Nigeria is the fourth African country – the others being Guinea, Liberia and Sierra Leone – to be hit by the violent outbreak that so far has claimed the life of 672 people out of 1201 confirmed cases. Disaster Medicine and Public Health Preparedness is publishing a special issue in 2014 on the role of communication in public health preparedness measures and response to pandemics, with particular reference to infectious disease outbreaks. A call for papers was launched and its deadline, which was June 30 has been postponed to August 22. Aim of this issue is to bring together the most relevant research about the factors that impact on communication strategies and their relative effectiveness during a pandemic. The panel that was established one years ago to advise the World Health Organization (WHO) about the outbreak of the Middle East Respiratory Syndrome (MERS) stated that the situation is concerning but is not an emergency yet. The members of the panel has met four times since last July and had to decide if it was necessary to declare the MERS outbreak a public health emergency of international concern (PHEIC). By claiming a PHEIC, the panel would have given WHO all the powers necessary to apply the International Health Regulations (IHR) in order to tackle the emergency. MERS threat outside the Middle East: will transparency help? The first known cases occurred in Jordan in April 2012. Two years later, the Middle East Respiratory Syndrome Coronavirus (MERS-CoV) reached the United States. The first American case, confirmed on May 1 2014 by the Centre for Disease Control and Prevention (CDC), is a traveler landed in Chicago from Saudi Arabia and now recovered in a hospital in Indiana. Just a week before, the Ministry of Health of Egypt reported the first laboratory-confirmed case of MERS-CoV infection in the country. Read more about MERS threat outside the Middle East: will transparency help? In a review on the New England Journal of Medicine, Harvey Fineberg, president of the Institute of Medicine and chair of an international committee requested by the World Health Organization (WHO), analyzed the global response to the 2009 H1N1 pandemic, giving particular attention to the function of the 2005 International Health Regulations (IHR) and the performance of the WHO. There is no good evidence about the effectiveness of Tamiflu (oseltamivir) and Relenza (zanamivir) for influenza prevention and treatment. This is the tough claim made by Cochrane Collaboration and the British Medical Journal (BMJ), based on the extended systematic review they just published about the use of neuraminidase inhibitors against influenza.